Joachim was married to Caroline Bonaparte, which made him Napoleon's brother-in-law. As a member of the Bonaparte family, great job opportunities came Joachim's way. Joachim had two sons, Napoléon-Achille and Napoléon-Lucien-Charles, as well as two daughters. Joachim signed on with the army in 1787. He was smart and courageous. He came to Napoleon's attention in 1795 when they put down a rebellion of anti-royalists in Paris. He later fought with Napoleon in Italy and Egypt. Joachim was also actively involved in the coup d'etat that put Napoleon into power. Napoleon thought he'd better keep the loyal ones close, and so he married Joachim to his sister Caroline. That was in the year 1800. Joachim went on fighting in important battles, such as the Battle of Marengo. Napoleon was very pleased with the boy and made him grand duke of Berg and Cleves and also sent him to Spain as lieutenant. Having arrived in Spain, ambitious Joachim thought it was a pity that the Spanish throne was vacant and tried to sit on it. But the Spaniards were very much against that idea and Joachim had to find something else he could dream about. Later Napoleon put his brother Joseph, who was previously king of Naples, on the Spanish throne. 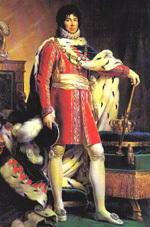 Knowing about Joachim's fondness of sitting on thrones, Napoleon made Joachim king of Naples. That was in the year 1808 and Joachim loved it. Napoleon called him Joachim-Napoléon, which would be Gioacchino-Napoleone in Italian, but the Italians kept calling him Gioacchino Murat. As king of Naples Joachim did a decent job. Among other things, he set up the Napoleonic Code and strengthened the economy. He continued his life as a solider but that worked only for a time. On the retreat from Moscow he simply abandoned his troops and hastened home because he felt his kingdom of Naples was in danger. Joachim then got caught up in the middle of European politics. 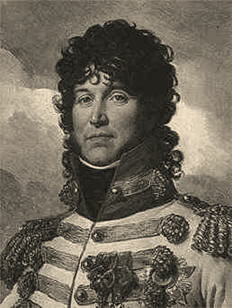 Napoleon's enemies courted Joachim Murat as a potential ally. In effect, Joachim didn't know whose side he should be on. And that got him killed. The Austrians sacked Naples and Joachim fled to Corsica. He tried to come back to Naples but got arrested and shot.